To make the most of the cool winter months, and to showcase its varied culinary specialties, La Ville Hotel & Suites CITY WALK Dubai has introduced an all-new menu at Graze B Burger Garden. 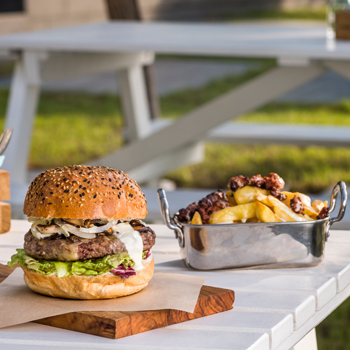 Set next to the GRAZE Gastro Grill terrace, the casual dining outdoor garden serves up a delectable array of some of the finest burgers in town, as well as a selection of fries, mocktails and freak shakes. The menu standout has to be the perfectly crafted Half Meter Surprise – which is rather surprisingly (or perhaps not) a whole 50cm long – quite possibly the longest burger in town! It features absolutely premium beef patties, lettuce, tomato, pickles, chimichurri mayo, Cheddar & Gruyère cheeses, guacamole, barbecue sauce and beef bacon. Although designed for one person with a ‘healthy appetite’, the Half Meter Surprise may be better suited for sharing! There is also the generous Double Trouble burger, made with 2 beef patties, guacamole and beef bacon, the American street food inspired Swiss & Mushroom with lots of Swiss cheese of course and a secret Paprika sauce, the Louisiana Creole-style BBQ Roasted Chicken with pineapple and Smoked Chipotle dressing, the Philly Steak Bun, an original recipe of thinly sliced Angus Striploin with the addition of GRAZE’s special veal jus and Guajillo --- and lots more! All burgers are served in home-baked buns, super fresh, fluffy and adding to the bursting flavours of the patties and matching fillings, sauces, marinades and flavourings. To accompany, there are Classic Fries, Nacho Fries, Meat Fries and Chorizo Fries – so whether you want plain, simple and tasty, vegetarian or carnivore, Tex-Mex, Poutine or Spanish-inspired, there’s something mouth-watering to suit all. Graze B is open weekdays 6pm - 11pm, Fridays 1pm - 11pm, Saturdays from 7pm - 11pm.